As I have always said, content is king (for driving online traffic). It has to be relevant, suitable for your audience and most importantly shareable. Over the years, the way we market our content has changed so it can be hard to ensure that your online message is not getting lost in the midst of the internet. 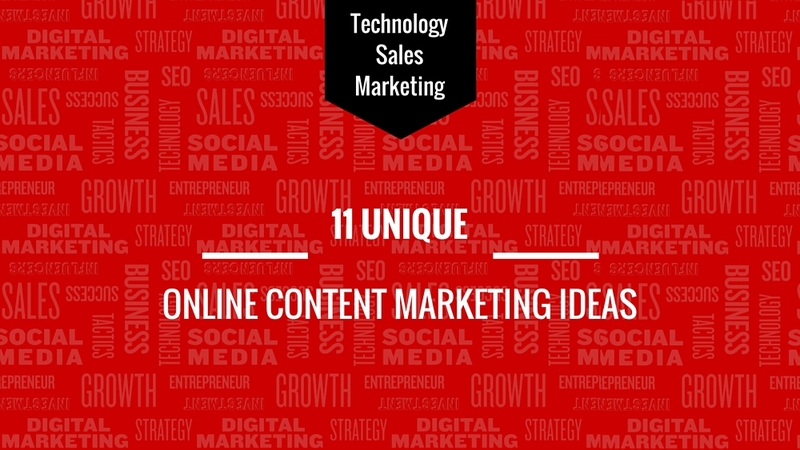 To be relevant, and to help make your content stand out, here are 11 unique online content marketing ideas. I love infographics and happily share them on social media, and I tend to write a fair amount of blog articles on infographics. They are engaging, visual and share-worthy. You can create an Infographic using Canva. If you want to propose a hypothetical target customer using your latest product, create a mock case study, and share it with your audience in a creative way. They can see you are understanding their needs, and will appreciate the time you spent creating the case study. To really capture the attention of your followers, you can create a content series which, for example, could consist of four different articles/pieces of content. If they show interest in the first, you can bet they will stay right until the last in your series of content. If you need target customer insight, ask. If you need to understand your target customer, and the kind of content they want to receive from you ask them. You can do this through a survey, quiz or a Q&A session. Make it as fun, and engaging as possible. If you are asking for insight on something extremely important, offer something complimentary in return for their participation. SMS marketing has not been adopted by many businesses as a way to content market YET, however it is becoming more popular than ever before. We are in a world of technology and most people have an addiction to their mobile phones. If you want a simple yes, or no answer from your audience, use an SMS application. Don’t forget to share your content on social media. If it is an infographic, or a nice visual, make sure you are instagramming it, pinning it to your pinterest board and sharing on Facebook. As I briefly mentioned in no.4, get involved with your community and run a Q&A session on Twitter. This is a great way to engage, and answer any questions your audience may have. Whether it be a customer service question, or industry related, make sure you give clear, and concise answers and don’t forget to thank them for their participation. Have you done your research to see what content marketing tools are innovative and engaging? To give you a head start, take a look at Openr. I have found great success using their pop up feature to market my content. At some point or another, you will have to create/share a data chart of some sort. There is more than just a typical bar graph and pie charts. Get creative and try some of the less used graph options, like spidergrams or circumplex. In my industry, writing a guide is extremely popular because our target market wants to know how to make their social media and digital marketing a success. Writing a glossary is another good way to share you expertise in an informative way to build trust whilst sharing great content. This is something I adopted as a way to content market. I have a variety of templates associated to my book; Think #Digital First which are downloadable, but first you must give me your name and email address. Always think about capturing leads. What are your favourite content marketing ideas?